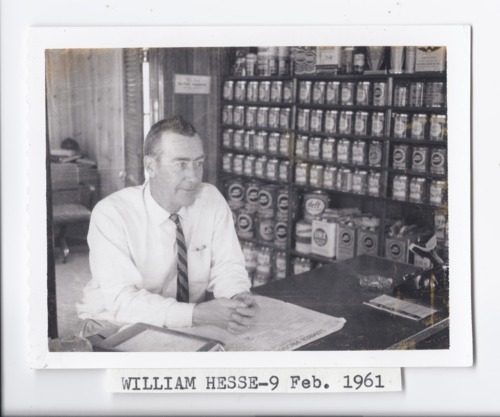 This picture of William L. Hesse, Rossville, Kansas, lumber dealer, was taken February 9, 1961. The J. Thomas Lumber Company started in Rossville in the 1880s. James B. Hall was manager for several years and in 1909 Mr. Vawter became manager. William Hesse started work at the yard in 1925, and in 1932 bought a half interest in the business and, in 1943, bought the other half. It then became the Hesse Lumber Company. His sons, Bill and Burns succeeded him in business. This photograph is provided through a pilot project to host unique cultural heritage materials from local libraries on Kansas Memory and was accomplished by mutual agreement between the Northeast Kansas Library System, the Rossville Community Library, and the Kansas Historical Society.